Oh good golly gosh do I love this polish. *Happy sigh* So this has been a long time lemming of mine. I finally caved and bought it on ebay for a ridiculous price. Less than $30, more than a Chanel, we'll just leave it at that. But I'm so happy I have it now. *Loves* By the way, sorry for the phantom post of this on Sunday. I accidentally hit post before I scheduled it. Oops. 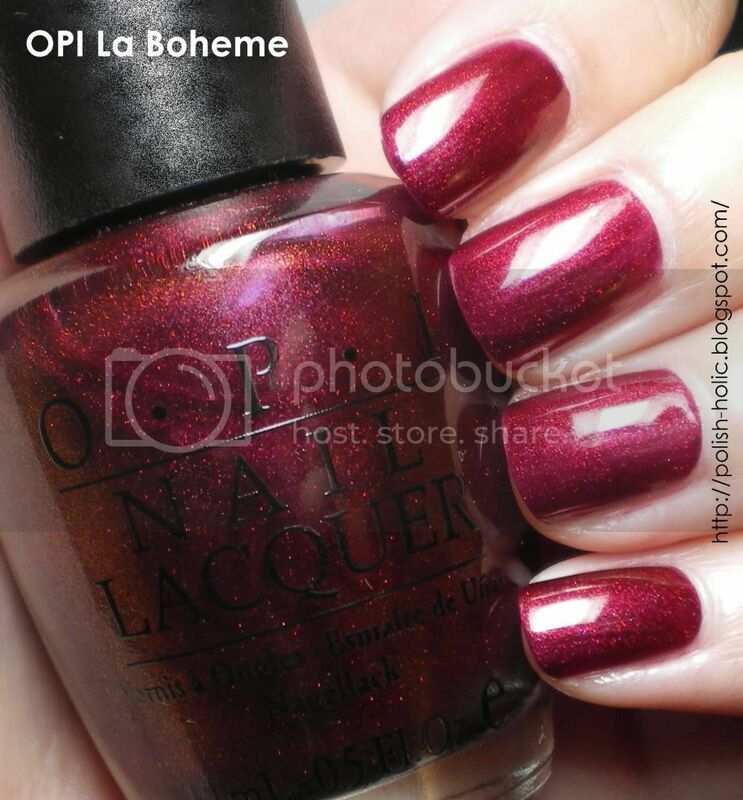 La Boheme is a magenta red shimmer with gold flash. I'd almost think it had micro-glitter, it's so shimmery. I think the gold flash is actually from all that gold shimmer. So it turns like this really vivid gold red at the right angle. I tried to capture the amazingness that is this polish, but I couldn't. LB isn't one of those really obvious duochromes. Heck, I don't think it's even a duochrome, it's more subtle, but so interesting to look at. With every movement of your hand it just looks different. Ya know... This is the fourth red that I've shown in a row, but this one is so worth it. And here's another pic to try and show you guys the gold flash. Two coats with top coat. I think it might have looked more intense at three coats, but it's fine at two. This is an old formula OPI. So it stinks like nuts, but overall good application. Pic of the moment: I find it amazing how a few perfectly placed lines can create something that our senses find just oh so cute. 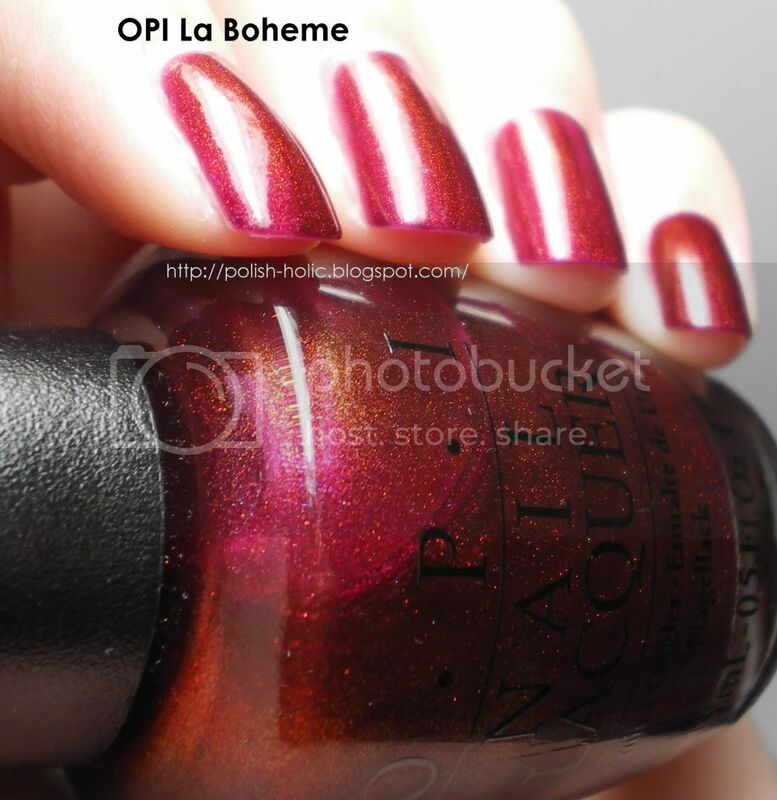 This polish is lovely, is like the warm toned version of Diva of Geneva! So true. 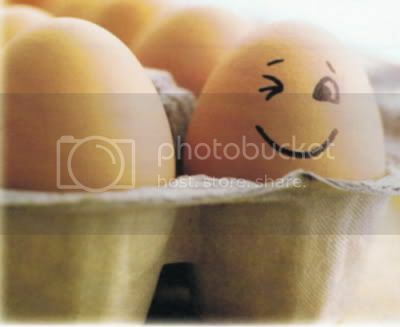 How does a bit of ink make an egg into a smile? Isn't being human amazing? Sarah: I don't think it's really warm toned. It just happens to have this kickass gold flash. But it stays in the cool toned side. jaljen: Totally is. It's something to contemplate. Oh I agree it's cool toned. Sarah: Ah, I gotcha. I think I might have to do a comparison to check this out.